This week has been incredibly rainy and gloomy. With a low cloud deck overhead I listened to my own rhythmic breathing and focused my attention on all the thoughts buzzing around in my head, my inner monologue. 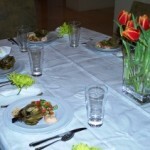 I decided on Monday that it was a week for thanksgiving and I would invite all the immediate family for a Shabbat dinner. You see my house is not in danger of sliding because of the deluge Southern California has suffered this week. Thank God, we don’t live in a burn area or a low lying area. As I sit here, at my computer, thoughts of Noah’s Arc are in the back of mind and I hear the downpour cascading through the gutter downspout and splashing off the patio. My invitees include my nephew who had a near brush with death because of one of those nasty bacterial infections that the hospitals seem to want to hush up. So tonight, the family will gather to celebrate being together and being in good health. The menu should be something humble, comforting, yet special. So here it is. 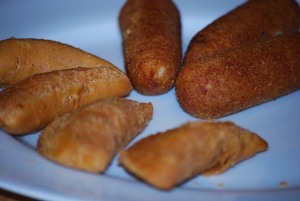 Pastelitos, El Salvadorian, deep fried ‘borekas’ with masa harina dough and chicken and vegetable filling. As you could imagine, I started making this yesterday. The lamb, short ribs, challah, chicken soup, and banana bread are all prepared. The appetizers I make in batches and keep on hand, in the freezer, ready to fry just before needed. They just have to be taken out of the freezer. The kibbeh and lahamajun are available in the freezer case at your local Jewish market if you are not inclined to make them. I think I had better stop writing now and get started cooking. 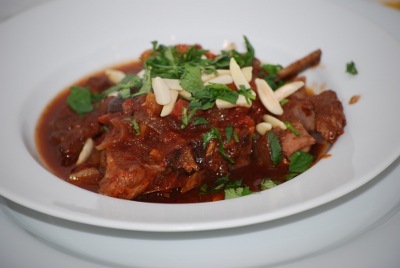 Below is the recipe for the lamb tagine. The rest of the recipes I will share in the near future. Shabbat Shalom. 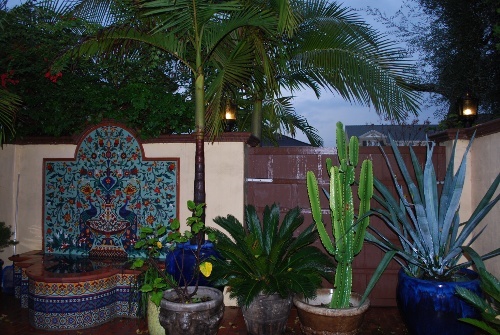 Acclaimed universally, the flavors of Morocco are complex, subtle, and irresistible. 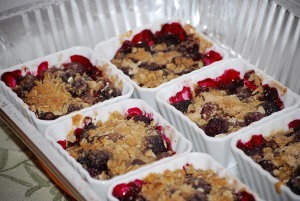 On a cold night when you want something warm and flavorful to serve, try this. 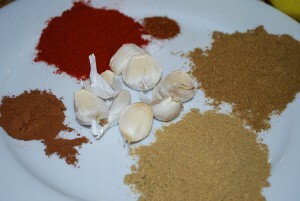 The richness of the lamb is a natural pairing with this spice blend. Order some lamb shoulder chops from your butcher and go home to find your inspiration. My taste testers loved it. 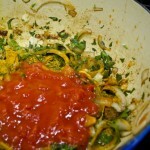 You don’t need a tagine to make this, a Dutch oven with a tight fitting lid will do. Combine the garlic cloves, lemon juice, and olive oil in a mini chopper, and purée. Next, add the spices and blend. Rub this paste all over the lamb chops. Set aside. Heat a very large Dutch oven, add 2 tablespoons of olive oil, and add the spice rubbed chops. The chops will not fit all at once, so brown them in batches being careful not to burn the spice. Add more oil if necessary. At this step, you are only coloring the chops, not cooking them through. Turn the heat down if necessary. 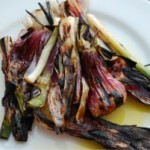 The searing is not really to cook them but impart a caramelized flavor. Remove the seared shanks to a plate and set aside. After all the chops are seared, add the onions to the Dutch oven and sauté until translucent, scraping up the browned bits of spice and meat into the onions. Add the cinnamon, stir, and then deglaze the pan by adding the wine. 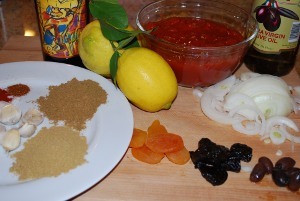 Once the alcohol has evaporated, add in the tomatoes, apricots, and prunes. Lastly add the olives. Stir this sauce and season with salt and pepper if you wish. Depending on what brand of crushed tomatoes you use, the sauce may need a little thinning with water if the tomatoes are very dry. Add the chops back into the pan nestling them down inside the sauce. 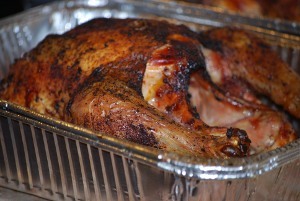 Cover with the lid and place the Dutch oven in a 325 degree oven for 2-3 hours. Check after 2 hours to make sure the sauce is not sticking or burning. The chop meat should be fork tender, falling off the bone. 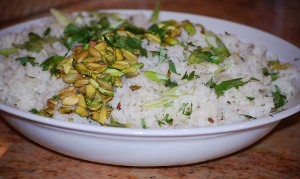 Serve on a platter sprinkled with parsley and toasted almonds. Couscous is a great accompaniment or rice pilaf. This dish reheats well and you can even make it ahead of time and freeze it. This meal is amazing. A true feast!!!! Would love to have your recipes for the starters. Especially, the kibbeh. I have made the biscotios twice already to rave reviews. Need to make a third batch soon!!! Thanks so much for that reicpe. Thanks so much. I look forward to your new posts. The recipes are so interesting, and I like the pictures and stories.